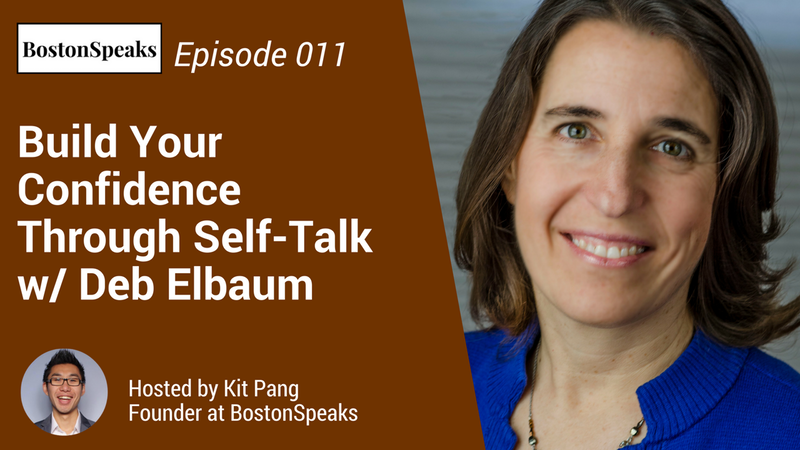 Listen to "Build Your Confidence Through Self-Talk w/ Deb Elbaum | BostonSpeaks 011" on Spreaker. When you're psyching yourself up for an interview or networking event, how do you talk to yourself? We're often not aware of what we say to ourselves, and we should be. We have the power to affect how we show up in conversations, and the first impression that we make. If we want to be confident and an effective communicator, there are ways to talk to ourselves. If you want to be confident at networking events, interviews, and when speaking or presenting, join career and life coach Deb Elbaum, MD, CPCC, ACC, who will share neuroscience information and easy tools you can use to change your self-communication strategies. -Affirmations that really work to make you feel better! Deb Elbaum, MD, CPCC, ACC is a coach, author, and speaker with a neuroscience background who helps men and women create change with confidence. She has spoken at organizations including the Bryant University Women's Summit, Astra Zeneca, and the Bioscience Network. The author of the chapter “Making Moments Count” in Coaching for Powerful Change (2016), her undergraduate and graduate degrees are from Harvard University and the University of Pennsylvania School of Medicine.